Prepare for a war in M-1 Challenge XXIII’s co-main event as the 2010 M-1 Selection Americas tournament winner, Tom “Da Tank” Gallicchio hooks up with current champion, Shamil Zavurov. With Zavurov putting his welterweight championship belt on the line for the very first time, the eerily similar fighting styles of both fighters are set to explode inside the confines of the five-rope ring. Fans can catch the title-tilt’s action from inside the Crocus City Arena in Moscow, Russia for free and LIVE on the official M-1 Global website (www.M-1Global.com) on Saturday March 5th starting at 11:00am EST / 8:00am PST. With his impressive submission victory over Alihan Magomedov in his first outing with M-1 Global this past December, Brazilian jiu jitsu ace, Vinny Magalhaes, has officially signed a six-fight contract with the European mixed martial arts promotion; details on the slick submission specialists first trip into the ring under the new 2-year deal will be announced shortly. If you’re a heavyweight fighter in Europe and you know the name Guram Gugenishvili, you’ve probably been put to sleep; with the way he’s been putting his opponents out on the canvass, he may as well become a licensed anaesthesiologist. Come March 5th when he steps into the ring to defend his heavyweight title against Eastern Europe’s 2010 M-1 Selection tournament winner, Maxim Grishin, fans should expect the seemingly emotionless giant to deliver an utterly dominant performance. Fighting out of Makariv, Kiev Oblast in the Ukraine, Gugenishvili has quietly amassed an undefeated and impressive 10-0 record on his way to capturing the title of M-1 Selection 2010 Eastern European Champion. What has been most notable about this prospect is his agility; at 6’4” and 250lbs, Gugenishvili moves around the ring lightly on his feet and stalks his opponents down like a starved lion hunting prey on an African plain. He’s methodical, calm and systematic in his movements; in his mind, he’s won the fight before the sound of the bell and the course of action within the ropes is only a formality. Bellator recently confirmed the Season 4 Light Heavyweight tournament will start in early 2011 and be shown on MTV2. Sherdog also found that BJJ black belt Daniel Gracie will fight in the tournament, and this makes him the first fighter to be announced. Gracie most recently fought at Israel FC: Genesis in November, picking up a rear-naked choke submission win against Martin Wojcik. The BJJ black belt holds a strong 8-2 pro record since first turning pro in 2002 with a split decision victory at PRIDE 21. Bellator today confirmed the organization’s Season 4 Light Heavyweight World Championship Tournament will begin in March 2011 on MTV2. Six of the eight fighters have already been picked for the tournament, and fight announcements are expected soon. The winner of the 2011 LHW tournament will win $100,000 and be awarded the light heavyweight championship. Well, one thing I can tell you one thing about the protracted negotioations between M-1 Global and Strikeforce--they're protracted. The good news is that both sides are still at the table, which means that a deal is still possible, probable even, if their statements are to be believed. However, the rumored bout between Fedor Emelianenko and Antonio "Big Foot" Silva is not going to happen in January, if at all. Both sides have issued statements that they are close to a deal, but they've been doing that for months. Not sure exactly what the hold up is, but my sources tell me a big sticking point is M&Ms. M-1 wants only red M&Ms in Fedor's locker room, while Strikeforce insists on a potpourri. These guys would still be haggling over a car price for a Model T, for crying out loud. 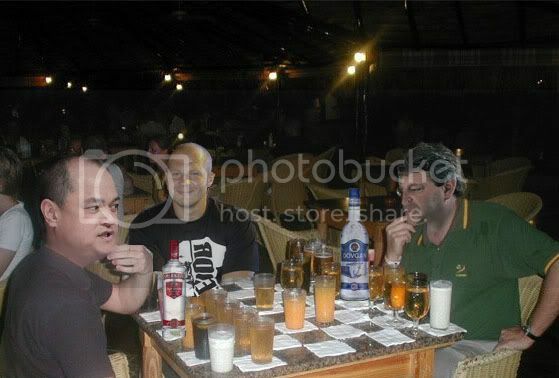 It's time that Vadim Finkelstein and Scott Coker got together in a locked room with a bunch of booze and stayed there until the deal was done, or until they both are carried out on stretchers due to alcohol poisoning. At this rate this is going, Fedor is going to be sponsored by Depends before he's in the cage again. Gentlemen, get it done! After the jump you can check our our spy catching up on the latest between Coker and Finkelstein. In a MacsMMA exclusive, we learned that Team Bombsquad's Pat Bennett's controversial draw will be overturned, and he'll pick up the well deserved win. Here's the article from MacsMMA. On Friday night live from the Druzhba arena in Moscow, Russia, Vyacheslav ‘Slava’ Vasilevsky stunned and bewildered his opponent, Tomas Narkun, with speed and agility. Forcing a verbal submission from Narkun, ‘Slava’ captured the first-ever M-1 Challenge light heavyweight belt as well as earning the evening’s Fight of the Night top honor; not bad for a fighter who weighed in at only 191 pounds. Opening up the fight both fighters took to the center of the canvas, stalked and circled each other as the pair tested their reach and speed. It didn’t take Vasilevsky long to sense that Narkun’s reaction speed to jabs, hooks and uppercuts simply weren’t there; from a spectator’s perspective, Narkun’s ability counter was elementary at best. Moscow, Russia (December 10, 2010) – Closing out 2010 with a phenomenal card, M-1 Challenge XXII and its tri-fecta of title tilts delivered on the promise of being M-1 Global’s most successful event this year. In front of a standing-room-only crowd at the Druzhba arena and to viewers around the world tuning into the live stream or on Russian Federal TV, fighters waged incredible wars that left the judges deciding the fate of only bout. M-1 Global's Evgeni Kogan: Sh*t Just Got Real! Interview with Ben Saunders from M-1 Global Selection: Americas Finals: That Just Happened! M-1 Finals Tonight: Let's Get it On! Baran's Breakdown: M-1 Global Selection - The Finals!